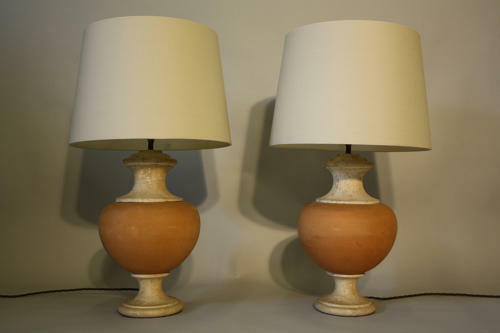 A gorgeous pair of earthy terracotta and travertine marble table lamps. French c1970. Elegant wide baluster shape they are styled here with pale coffee shades. Height to shade is 70cm, shade width is 40cm and without shade height is 51cm. Fully rewired and PAT tested for UK use. I would put these anywhere in a house they are so harmonious!